We caught up with Stacked Wonky’s Artistic Director Sarah Shorten to find out all about their exciting new dance project with National Youth Dance Company (NYDC). Alison Lord, Director of Dance put NYDC in touch with Sarah Shorten, Artistic Director of Stacked Wonky. Sarah has been making incredible and high-profile site work in West Somerset for years and knows the area well – she lives there and her children go to school there – “…it’s a close knit community and I knew you couldn’t just arrive and expect people to ‘get it’. The process would need to be more interactive and involve local people, working closely with them to build something” Sarah said “After initial conversations with NYDC where they wanted to understand the wider landscape of participation, performance and opportunity in West Somerset, and how Wonky works, I got the feeling an exchange with the NYDC with site work at its heart could be the way to go”. Since Alison’s introduction Sarah has been working collaboratively with Elaine Foley, project manager at NYDC, to define each stage of the project. They started with an open exchange, with Stacked Wonky visiting Sadlers Wells to watch the premiere of NYDC’s new performance ‘Used To Be Blonde’ by Artistic Director, Sharon Eyal. The following day Stacked Wonky performed on stage for members of NYDC with their piece ………. to rapturous applause!! 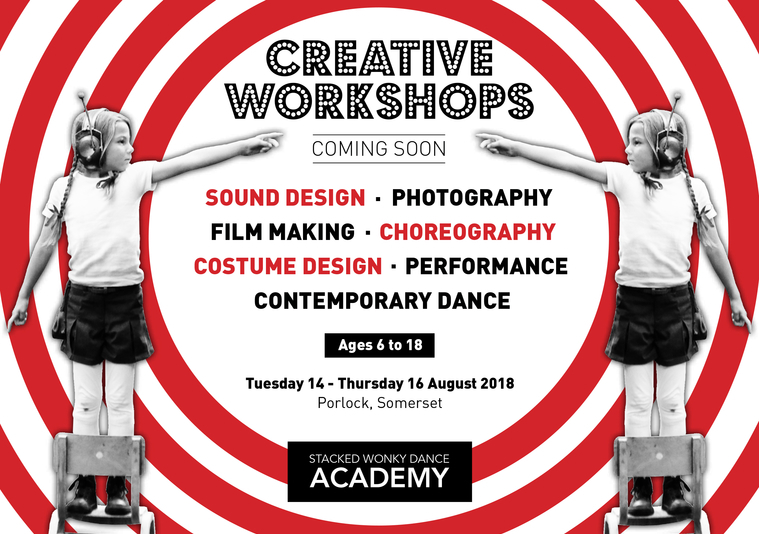 In return 7 young dancers from NYDC and two members of the NYDC team will be welcomed to be involved with the Stacked Wonky Academy in August. The Academy runs over 3 days in Porlock and will take place at Grade II listed site ‘New Place’ offering a series of workshops based on site specific based learning. Sarah said “Collaboration and problem-solving lie at the heart of the Academy. Rather than replicate a traditional classroom setting, we’ll be helping students to explore the basics of each aspect of performance making and encouraging them to experiment both individually and in groups”. It is hoped that the relationship with NYDC continues beyond the life of the project. Sarah wants to continue to work with NYDC on a potential co-commissioning project and hopes that NYDC will bring one of their pieces to Somerset next year as part of Take Art’s annual Spring Forward Festival, linking into the Sadlers Wells 20 year celebrations. Alison Lord says “Building a legacy and bringing more people into the project from the area will enable us to build further and lasting relationships. We have already started to build collaborations with local people, schools, organisations and dance partners such as LA Dance Festival led by Lorraine Ahern. We hope to build on these kinds of opportunities and to ensure that that this goes some way to making a difference to young people who live in West Somerset”. For anyone who may be interested in finding out more about NYDC, there will be an opportunity to meet them in Porlock on the evening of Wednesday 15 August, for more information contact fiona@stackedwonky.com.